Over night... 12 inches of fresh powder snow! The ski resorts won't have to make their own snow this year. Feel frozen just looking at your photos Lori... Here our 'green' is just making an appearance. Temps more normal this week. I lost the roof vents on my greenhouse to seventy mile an hour winds, Meadow. It's just behind the tree limb in the photo, and the snow is up to the roof on either side. What a mess it's going to be when the melting starts. Wow, strong winds indeed... 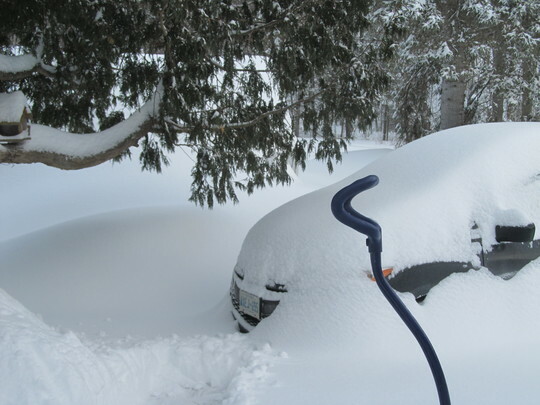 I don't envy you the clear up..... How long is the snow forecast to hang around Lori? The snow is usually still quite deep in the forest in March when I'm doing the sugaring, but most often it is quite gone by late April. last year we had a lot of snow in April and May was terribly cold until almost the end of the month. The transition from winter to summer was instantaneous..or so it seemed. The Ministry of the Environment spokesman is telling us that this spring will not be like the last two... it should be more like the "normal" we've had in decades past. We can put our gardens in on the 24th of May weekend without worry. He's gambling his credibility on weather models that haven't been working for the last few years... is he right? only time will tell us. ;-) personally, I'm so ready for spring. Pleeease let it be! thanks for the good vibes, Amy. Sugaring is just another term for tapping trees for maple sap. You can also tap birch trees. brings back memories of my grandad's sugar bush and the sweet steamy air of the sugar shack. Glad you asked what sugaring was, Amy.... I was thinking of a beauty treatment!!! Now we know.